Despite the rather high prices charged by the restaurants and cafés under the arches that skirt the square, this is still a marvellous place to sit out, try some good Spanish wine, sample some tasty tapas and watch the passers-by. Over the years, the square has had many different names. 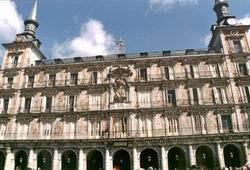 Located at the confluence of the paths towards Toledo and Atocha, it was originally the site of the "Plaza del Arrabal" market and thus took this name before later becoming the Plaza Mayor. 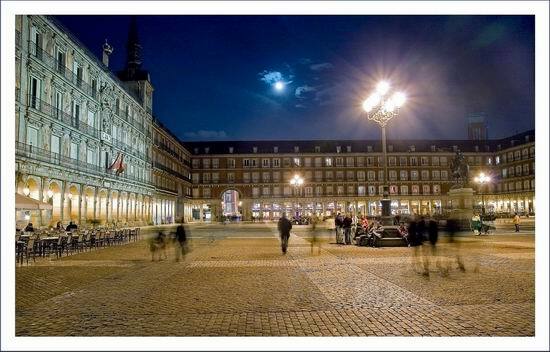 Since then it has also been called the Plaza de la Constitución, Plaza Real and Plaza de la República before returning to the now famous Plaza Mayor name at the end of the Spanish Civil War. Public executions, crowning ceremonies, bullfights, Inquisition trials and diverse fiestas have all taken place right here in the square. The square is mostly surrounded by three-storey houses with balconies looking out onto the square and still lived in by the fortunate few. Located at the north end of the square resides the four-storey Casa de la Panadería building, supposedly named after the bakery it replaced. The construction of this building and its colourful façade of frescos was initiated in 1590 and it has been renovated several times over the years, most recently when the frescos were repainted with designs by Carlos Franco, in 1992.